This post was updated on July 2, 2016 with a new method to set your signature with GMass. When you click the COMPOSE button to compose a new message from scratch, the signature will always appear in the Message. You then put in your recipients, Subject, Message, and hit the GMass button if you’re sending an email marketing campaign. 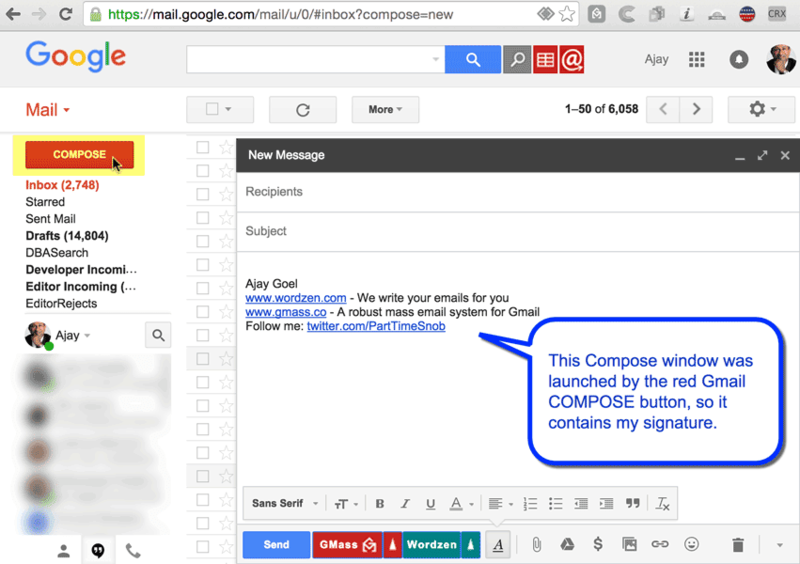 Or, hit the regular Gmail Send button if you’re not sending an email campaign. These three features correspond to the three buttons GMass adds next to the Gmail search bar. The Compose window launched in these instances will contain your email list addresses in the To field, but not your Signature in the body. The reason your Gmail signature won’t appear in the Compose window when you use one of these features has to do with the nature in which the Compose window is launched. GMass uses the Gmail API for much of its functionality, and in these cases, GMass creates a blank Draft behind the scenes and then launches the Draft as a Compose window in these three cases. The Gmail API, however, does not have a method that allows GMass to retrieve a user’s signature programatically. Therefore when GMass creates the blank draft with the Gmail API and sets the To addresses, there is no way for GMass to also insert your signature into the body. When you click the COMPOSE button, it is Gmail itself that is launching the window, and Gmail obviously has access to your signature. 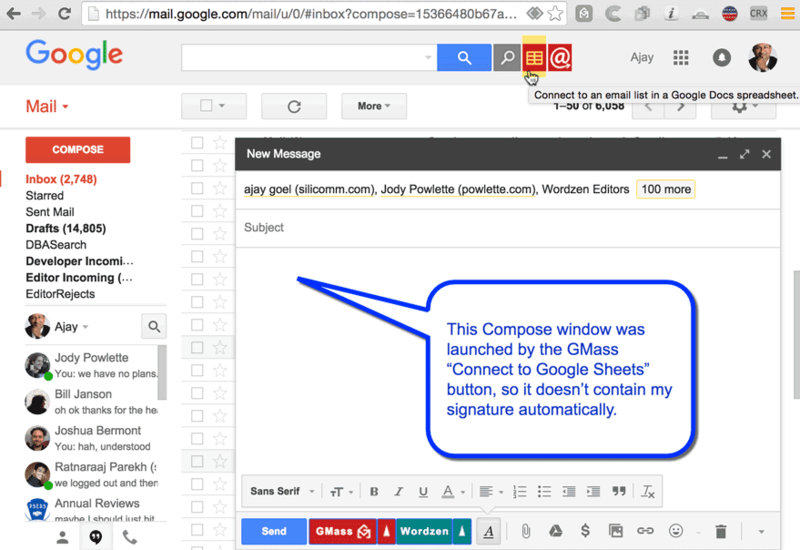 If Gmail enhanced its API to make users’ signatures available through a method call, then we could insert your signature in every Compose window, even if it’s launched via the three aforementioned features. Update as of July 2, 2016: We have just created a new technique to save your signature with GMass. Now even if GMass launches the Compose window, it can insert your signature. You just have to save your signature with GMass first. Here’s how to save your signature with GMass.